Good Faith's (Thee Desperado x MinstrilsMonaLisa) path to our farm was serendipitous and we are tremendously grateful for the time she was entrusted to our care. Good Faith's stellar lineage was obvious in her highly refined look. Due to an injury as a filly, however, Good Faith was prevented from showing. This same injury also meant that Good Faith was unable to carry a foal to term. 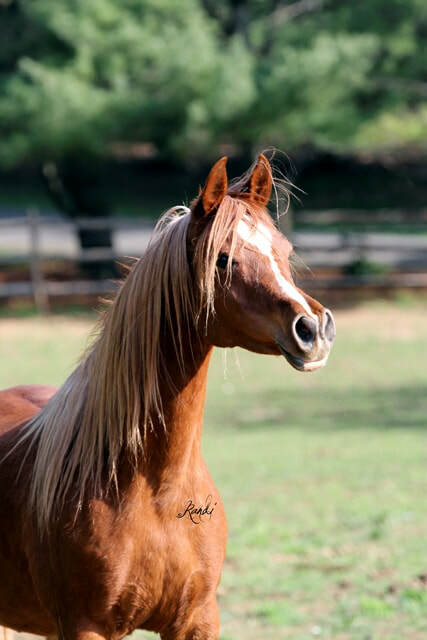 And so, after receiving Good Faith from our dear friends at Yorklyn Arabians, we reshaped our breeding program around her disability and began utilizing embryo transfers with surrogate mares. Good Faith's favorite part of the year was joining the weanlings in the field as their loving aunt. The rest is history in the making. Good Faith is a formidable dam whose offspring, Caiiro and Daenerys, are phenoms in the Egyptian Arabian and open Arabian show circuits. Unfortunately, Good Faith passed in 2014. Daenerys and Drogo were her final foals. Among those in our herd, what most set Good Faith apart was her gentleness and kindness. This loving disposition is obvious in all of her progeny and is one of her most shining achievements. Good Faith produced world-class mares and stallions that, appearance and conformation aside, you can't help but adore.